You’ve integrated the technology and tools for driving the transformation. Now allow it to immerse within your system gradually, what can be further accomplished beneath the surface?. Where are your applications over or underperforming, what percentage of resources are spread too thin through over-utilization, which identified deficiencies can be improved to save on cost & manual time? These are just some of the questions generated by delving deeper into the data management realm. The potency of AppDimensions can be fully capitalized on when taking advantage of the relevant functions the tool provides through its machine learning capabilities in this final & continuous step. AppDimensions built-in machine learning engine will make the systems self-governed, optimised and predictive as time goes. Desired operations state will be learnt and deviations quickly identified, leading to brisk corrective actions. Manual time & incurred cost will be reduced significantly once the process of exposing deficiencies and producing feasible solutions becomes automized. Long-term benefits are multiplied once this transition is perfected. Specifically, AppDimensions establishes a baseline after learning period and Predicts negative outcomes before they happen and recommends preventive measures automatically. Governance will be an ongoing activity throughout this process, continuously reporting governance scores against the defined set of outcomes. 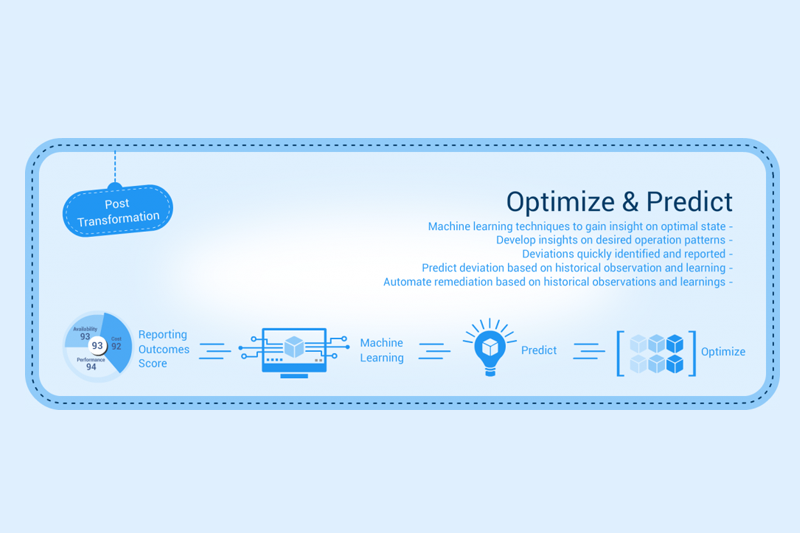 This will help enterprise track the improvements through a quantitative unit of measurement and can attribute to the actions suggested through the optimization process powered by machine learning engine.